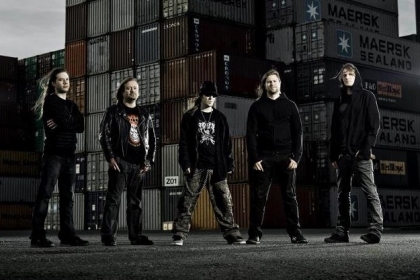 One thing that Finnish metallers Children of Bodom are known for is their habit of including cover versions as bonus tracks on their albums, and as separate releases (the "Skeletons in the closet" album was a full album of cover versions . These are usually songs that you wouldnt think of as being anything like the band's usual music, and are often absolutely brilliant - one of my favourites is their cover of "Ghostriders in the sky", but they have also covered songs by bands including Creedence Clearwater Revival, Pat Benatar, The Ramones, Britney Spears, Anthrax, Kenny Rogers and many more. On their recently released greatest hits album - Holiday at lake Bodom (15 years of wasted youth) there were two such cover versions - "I'm shipping up to Boston" originally by the Dropkick Murphys, and "Jessie's girl" originally by Rick Springfield. "I'm shipping up to Boston" is a song from Irish punks The Dropkick Murphys, although the lyrics were written by folk singer Woody Guthrie. It's a great song, and Children of Bodom have wisely chosen not to make too many changes with the song. Children of Bodom have given the song a bit more powerand a slightly more metal feel, and the guitars are slightly more prominent, but other than that it's a pretty faithful cover. It's got a great party feel to it and really is a superb track. Whether fans will choose to buy the album - Holiday at lake Bodom (15 years of wasted youth) or will instead choose to buy the tracks they want via itunes etc remains to be seen, but either way this is a song that fans should certainly get.